Pro-Kurdish Peoples’ Democratic Party (HDP) spokesperson Ayhan Bilgen announced on Monday that at least 237 officials from his party have been detained in simultaneous raids since Monday morning. The detainees include HDP provincial and district branch heads in provinces such as İstanbul, Ankara, İzmir, Adana, Mersin and Şanlıurfa. The party’s Diyarbakır deputy Demirel and Siirt deputy Konca were also taken to the Ankara Police Department after being detained in front of HDP headquarters in Ankara late Monday evening. Police raids on HDP offices and the houses of party officials came after an offshoot of the Kurdistan Workers’ Party (PKK) on Sunday claimed responsibility for twin bombings that killed 44 people and wounded more than 160 outside Vodafone Arena in the Beşiktaş district of İstanbul on Saturday. 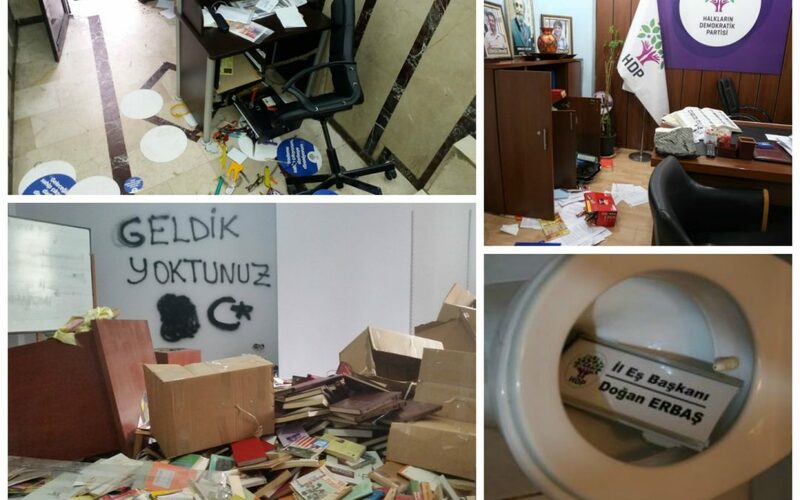 Police teams left a note on a wall of the HDP provincial branch in İstanbul that read: “We came but you were not here,” while desks were turned over and books in the building were scattered around during the raid. Bilgen asked how the note left on the wall of the HDP office in İstanbul has anything to do with the efforts to find the masterminds of the twin bomb attacks in İstanbul. “Is this an act of revenge,” he asked, referring to remarks from Turkey’s Interior Minister Süleyman Soylu, who said Turkey would take revenge for the victims of Saturday’s bombings. Turkey has stepped up its crackdown on Kurdish politicians in recent months. Courts arrested 10 deputies from the HDP last month and have seized the administration of scores of municipalities and jailed dozens of mayors in southeastern Turkey over the past months. Giving some figures about the ongoing crackdown on the HDP, Bilgen said 7,432 people from the HDP have been detained since July 22, 2015 and that 2,345 of them have been arrested. “The figures continue to rise,” he added. In the meantime, Turkey’s Interior Ministry also released a statement on Monday about the detention of HDP officials and said a total of 235 people have been detained across Turkey on charges of involvement in activities on behalf of the terror organization (PKK) and making its propoganda on social media.